You really don't want to get rid of the PCV valve, if that's what you're getting at. The PCV system is there for a reason when the IM is under vacuum as well to help scavenge excess crankcase pressure and moisture as well. Completely removing the PCV valve on an engine isn't a good idea. If you're not saying that and simply suggesting to add another vent for when under boost, that would be a good idea as well. But, the turbo definitely helps scavenge the pressure due to the vacuum it creates while under boost. My car is on Speed Density right now, and I installed a catch setup with -6AN lines on the PCV valve and the valve cover, -6AN tubing all the way to a catch with two ports, a 2" vented air filter and a drain plug. The PCV port on the IM is plugged and sealed very well. This way the PCV system is constantly vented, all oil is trapped in the catch and not recirculated. What is the disadvantage of a setup like mine? none at all, except for the fact you're venting gases and vapors into your engine bay now from the catch can. Also a vented catch can will create a lot of condensation. unless im misunderstanding what your doing, your enging is going to ingest all that if you do the line to the inlet. if it just breathes into the engine compartment, the chances of your engine sucking those fumes in is slim to none. dont you know what happens once air gets sucked through the turbo inlet? it goes out the exhaust lol. it will ALL be going out the exhaust! The only reason people dont like going the air intake route, is because if a motor does have bad oil blowby it will gum up and make a mess of the intercooler and piping etc.. i checked all my piping no signs of oil, so im not getting any blowby like that. if you tap and make only the ORIGINAL vent holes on the valve cover bigger you wont create any more or less oily mess then factory. I dont get any oil in there now and i dont even have a catch can! it was just using the factory 5/16 to my fp intake and no signs of oil! yeah, but its not good clean fresh air. like i said a few pages ago, try it but keep an eye on it. This isn't a good idea because you don't get the vacuum scavenging the crankcase. It's not just pressure that you want to vent but contaminants such as moisture that gets into the oil and engine. 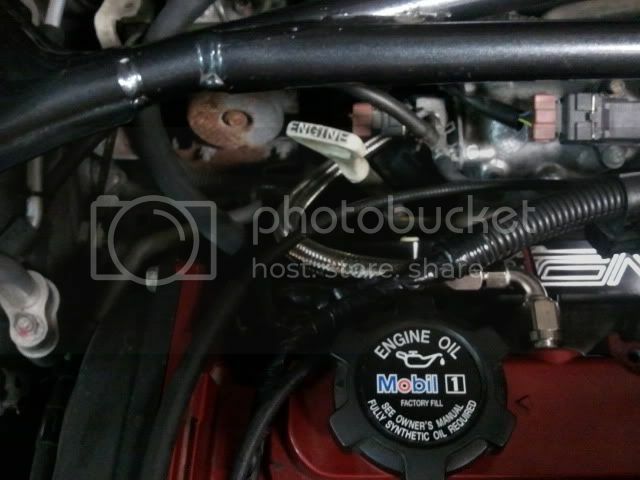 I don't think I have to explain why moisture in an engine would be a bad thing. Under vacuum, the PCV allows clean filtered air to come through the air filter, through the breather line in the intake pipe, under the valve cover to mix with any water vapor, oil vapor, etc, and then the vacuum in the intake manifold pulls it in to get burned in the cylinder. It's not just for emissions...it definitely has it's engineering purposes. Of course under boost, now the IM is pressurized and the PCV valve is closed. Now any crankcase pressure only has the breather hose to exit. Now the flow is reversed from the above screnario. This is why it's important to have the breather hose connected to the turbo intake pipe. 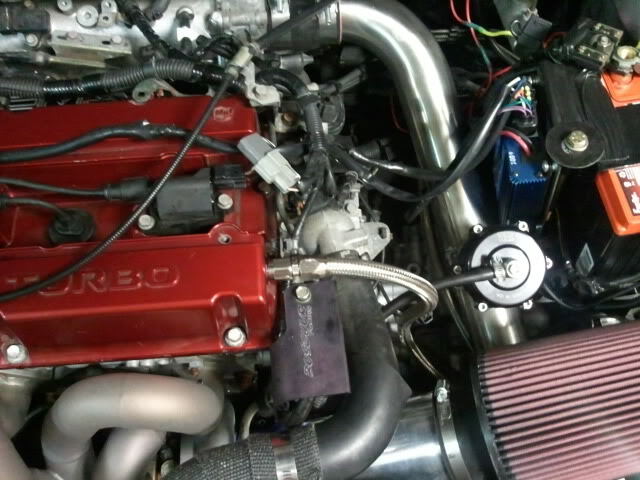 The turbo now provides the suction and vacuum to scavenge and excess crankcase pressure and vapors due to blowby, etc. Simply having that little breather hole with no vacuum assistance isn't going to do much there and that's when the dipstick issues come into play. Of course, if you have a very well broken in motor with little to no blow-by issues of course you aren't going to have blow-by issues. But, that is the reason why it happens. But, what I first described is why the PCV valve is there and why it shouldn't be removed and vented. If you keep the oem pcv setup, yes the turbo will provide vacuum but under boost the check valve closes on the other end.. The turbo doesn't provide the vacuum while the IM is under vacuum. The flow is as I described in my post above. The throw throug the valve cover breather reverses direction when under vacuum or boost. What I am trying to say is, unplug the recirculation of the pcv's and vent them all. I completely disagree as per my post above. A lot of good information in this thread. Since I am on a VSR and not a stock intake mani or intake tube I am running a all-star catch can with dual bung's, and a filter on top (same as AMS catch can) and drilled the stock pcv hole out to accommodate a -10 an fitting, then the same with the driver side pre-exsisting port and I ran -10 line to the catch can. Like most I am getting a lot of water / condensation / stinky *** combo in my catch can. I was doing some testing with the catch can and when pressure is applied to one port of the catch can or the other the flow of pressure is a lot higher in flowing out of the opposite port and a lot less coming out of the filter on top of the catch can. So it seems that is hurting relieving pressure a ton instead of helping. To prevent this I am messing with the idea of adding a 1 way check valve / back flow preventer to each port of the catch can, then capping off the top of the catch can and running the bottom drain of the can to a fitting on the exhaust at about a 45* angle (post 02 sensor). If I try that out then I would probably add a air / water, oil separator to the line going to the exhaust. This in turn would create a good amount of vacuum to assist in relieving crank case pressure. That or I would really like the try adding a electric / belt driven vacuum pump instead. i know its a sti, so it doesnt cross over 100%, but my 07 sti with a loose built motor had the pcv deleted and a vta catch can. i drove it nearly every day rain or shine. never any sludge or condensation anywhere in the motor. turbo was spotless along with all the piping, intercooler and throttle body. if there was a downside to no pcv and vta, i sure couldnt find one. I appreciate the input and not trying to state anything against your experinces, but the reasoning for the PCV system still is valid. If you eliminate it, how or when you may see problems and the extent and severity are big variables, but that doesn't mean they don't exist. That's like someone that has been smoking for 20 years says he feels fine and is healthy....until 20 years down the road he dies of lung cancer. We know smoking causes cancer, we just don't know the exact timeframe from person to person and the variables involved that lead to cancer. I definitely wasn't trying to pinpoint any certain timeframe or saying that your car will break down in a week. I was merely pointing out the function of the PCV system and what it does, which has been proven. Whether or not you want to run your car with one is definitely up to the preference of the owner. Last edited by l2r99gst; Nov 24, 2010 at 07:14 PM. I definitely wasn't trying to pinpoint any certain timeframe or saying that your car will break down in a week. I was merely pointing out the function of the PCV system and what it does, which has been proven. im a proponent of keeping it as simple as possible. to me a pcv valve is another component that can fail and cause a headache. does it have benefits? sure! but its also a great spot for boost to get into the crankcase if it fails. I have run oil analysis on my oil changes before. I will do one after 1000 miles with the PCV deleted and try and show a change in water levels in the oil. I will post up my results to see if it really makes that big of a difference.